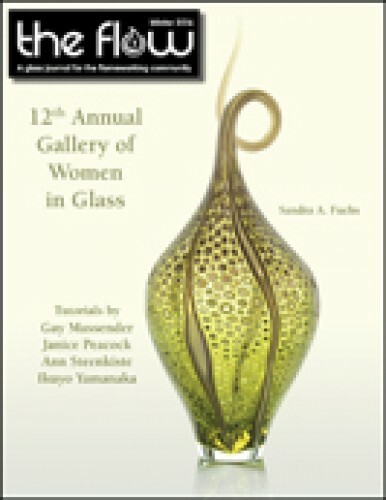 Jennifer Menzies, editor of The Flow, welcomes readers to the 12th Annual Women in Glass issue, which includes a gallery featuring 160 female flameworking artists. The editor also shares news of several upcoming tradeshows that The Flow will be helping to sponsor in 2017. The Flow Winter 2016 gallery features the work of 160 female flameworking artists. This collection showcases beautiful and innovative glass art that includes animals, pets, sea life, and florals plus mythological characters, sculptural work, and beads, other jewelry, and much more. The Corning Museum of Glass partners with Celebrity Cruises to bring the beauty of hot glass to its cruise passengers with live demonstrations. Recently a trio of all-female hot glass artists demonstrated how hot glass works to the passengers on the Eclipse as it sailed to several Scandinavian countries. Every four years or so, the Glass Art Society includes a glass fashion show, the brain child of Laura Donefer. Artists from all over the world create wearable pieces made from glass. The 2016 show included glass studded clothing, crowns, an alligator man costume, and even a coat made entirely from glass. Beloved American artist, Ginny Ruffner, has enjoyed a distinguished career spanning more than three decades. 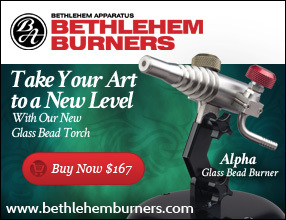 The artist helped redefine flameworked glass, previously known as the process of tchotchkes and trinkets, as a sculptural medium for fine art. How she came back after an almost fatal car accident speaks to strength of character. Gay Massender demonstrates techniques for creating still life beads that feature small vases filled with flowers created from murrine chips, fine black stringer drawings, and swirls of glass. The beads are influenced by the look of impressionist still lifes, with glass colors chosen to reflect that period of artwork. Janice Peacock demonstrates decorating a base bicone bead with dichroic gems, silver foil pieces, and frit. The look of a vase is developed for the bead by adding a vase lip from a contrasting color, then adding handles from large dots that are snipped and formed into arches. 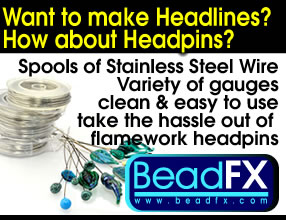 Ann Steenkiste demonstrates how to make a hollow base bead that is sliced into circles. The slices are then marked, cut, and cold worked before assembling full circles, half circles, and quarter circles into a sphere shape. Tips are included for making the best use of common cold working shop machines. Ikuyo Yamanaka demonstrates techniques for using transparent glass to wrap cylindrical white beads. Pieces of cane are then created and used to cover the entire wrapped bead. The final step adds slices of flower murrine cane to add flowers to the decorated beads.